It was time for some new waders. I've always had Simms G3 Guide Waders. I have a lot of hours spread across 10 years with the last two generations of these time proven waders with great success I'll add. While the two older generations of waders served me well I was hopeful for some improvements in this new 2018 model. I'll kick this review off with "comfort!" After my first day in these New G3 Guide Waders I noticed they felt very comfortable. By comfortable I mean light, breathable and all around good fit. Five days in a row I spent hiking, climbing, wading, crossing rivers (everything except swimming, thankfully), all in total comfort. Certain that they were actually lighter in weight I scale checked the new G3's against my past two generation G3's and the new ones are in fact lighter. In addition to being approximately a couple ounces lighter, they also felt more breathable. Without scientific evidence of breath-ability I'll just once again affirm the new G3 Guide waders just feel more comfortable, period. Thank you Simms for putting zippers on the reach-through microfleece-lined hand warmer chest pocket. Besides being able to stash stuff without worry of losing things, zippers also prevent things like tree limbs, boat oars and rod butts getting caught in the pocket flap. Also the addition of the Super-Fly Patch is a nice feature. Most the time I don't use the Tender Pocket so being able to remove it is a great convenience. It's not that I don't ever use it. I find it a great feature when I go out for an evening of swinging flies and just want to leave my pack at home and be minimal. I rig the Tender Pocket as needed and have it always ready to go for those quick swing trips. On extended fishing trips I usually carry a pack and don't need to have the tippet pocket; just unzip and leave it behind. A thoughtful addition Simms gave this Tippet Tender Pocket is a safety zipper loop to secure the pocket preventing it from becoming unzipped by accident. 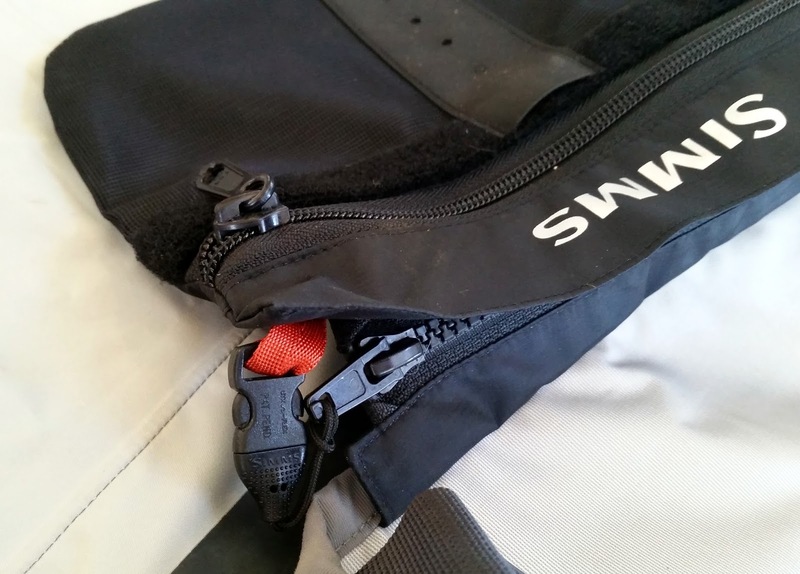 The zipper pocket system also allows you to switch the tippet tender for an accessory add-on Waterproof Wader Pouch from things like phones and cameras. The included stretch wading belt along with the low profile belt loops worked really well together. Waist location the belt sits on felt very natural. With my previous pair of G3's I didn't use the belt loops because they seem to sit too low. I'm going to call this "improved." Over many years of wading I've learned that a stretch wading belts are the only way to wade. 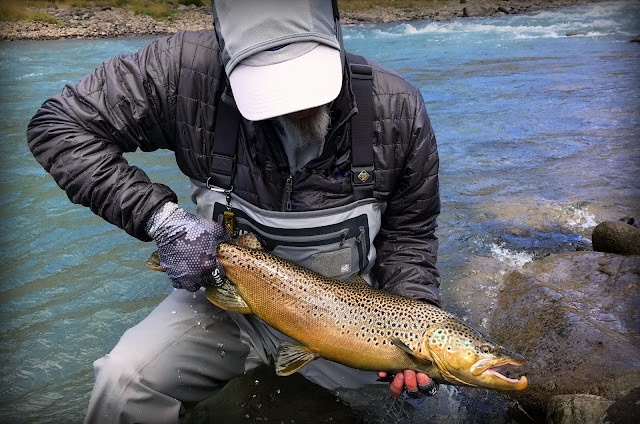 Stretch wading belts provide more comfort and freedom of movement than a non-stretch style belts and you don't waste time trying to adjust a wet belt on the side of the river. The abrasion-resistant built in Gravel Guards worked great. The only reason I mention these is that on my last pair of G3's my gravel guards seemed really hard to stretch over my boots. These seemed to be easier. They look like the same rugged material so I don't know what's different but I'm going to label them as "improved." The stockingfoot feet are great fitting as always, never had an issue. 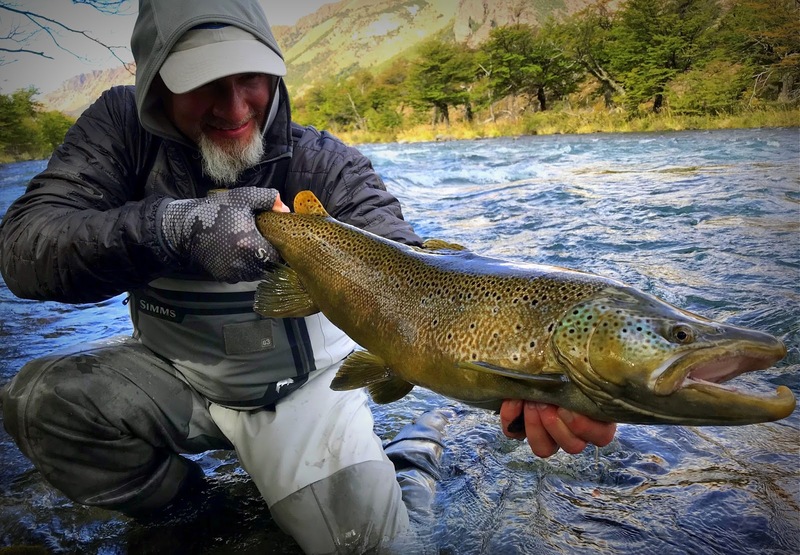 After living in these new waders for 5 days straight, hiking and wading miles of river through some rugged Patagonia / Chile countryside I can say without hesitation the New G3 Guide Waders are better then ever. I can't wait for my next adventure in my New Simms G3 Guide Waders.